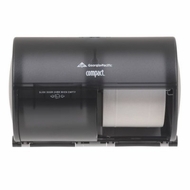 Attractive Compact double roll, side-by-side coreless bathroom tissue dispensing system provides up to six times the capacity of single standard 2-ply rolls while maintaining your professional look. This dispenser delivers 3000 sheets of quality 2-ply tissue or 6000 sheets 1-ply for continuous service and increased patron satisfaction. Featuring a transfer paddle to prevent access to a new roll before the current roll is completely used up, this dispenser offers one of the most cost-effective solutions for high-capacity toilet paper dispensing.